This Demonstration shows the nonparametric estimation of a standard normal variable cumulative distribution function (CDF) , under a stochastic order restriction. A pseudorandom data generation process produces a standard normal variable with distribution function and data size , and a uniform variable with data size . Mathematica's built-in inverse normal distribution function utilizes to generate another normal variable with distribution function and data size , under the stochastic restriction ( ). This restriction may be imposed by three different shift patterns (see Details). While the usual (unrestricted) empirical distribution function (EDF) estimator uses information only from variable , the maximum likelihood estimators (MLE) , , and use information from variables and or . The comparative study  shows that outperforms all other estimators when the underlying distributions are "close" to each other. You can use the controls to experiment on a variety of settings and observe the performance of the four estimators. 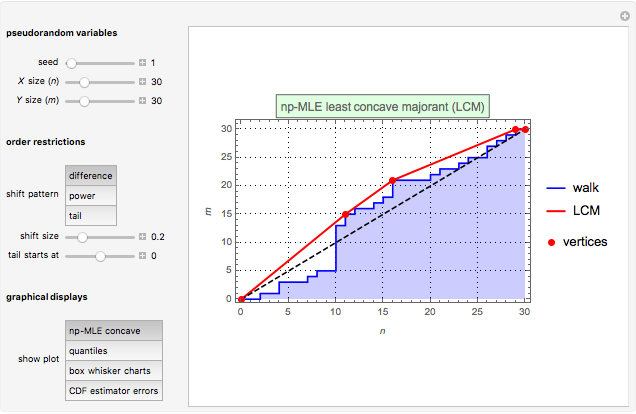 The first graphic displays the construction of the np-MLE least concave majorant (LCM) according to the , ordered random walk. 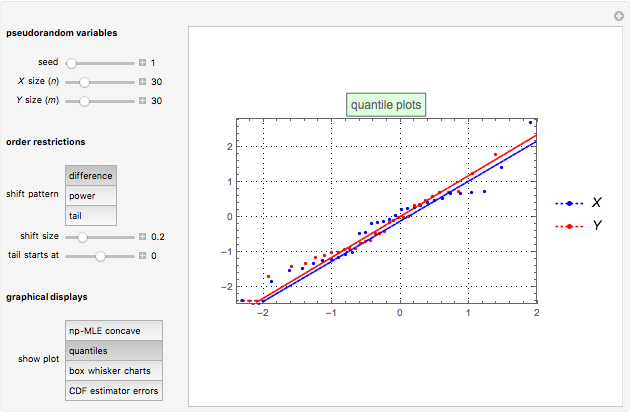 The second graphic displays the quantile plots for and . 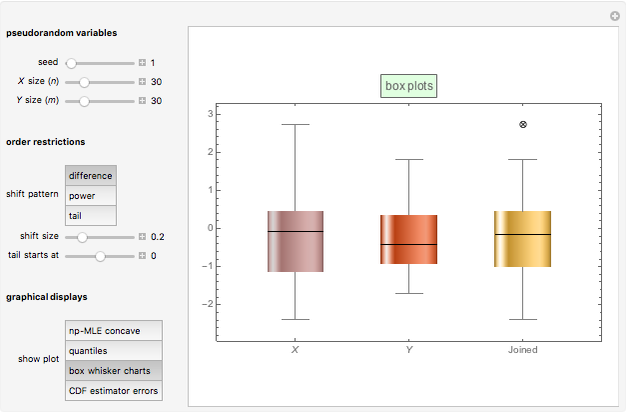 The third graphic displays the box plots for , , and . Finally, the fourth graphic displays the estimator errors against the theoretical standard normal quantiles. O. Davidov and G. Iliopoulos, "Estimating a Distribution Function Subject to a Stochastic Order Restriction: A Comparative Study," Journal of Nonparametric Statistics, 24(4), 2012 pp. 923–933. H. D. Brunk, W. E. Franck, D. L. Hanson, and R. V. Hogg, "Maximum Likelihood Estimation of the Distributions of Two Stochastically Ordered Random Variables," Journal of the American Statistical Association, 61(316), 1966 pp. 1067–1080. R. V. Hogg, "On Models and Hypotheses with Restricted Alternatives," Journal of the American Statistical Association, 60(312), 1965 pp. 1153–1162. S. Lo, "Estimation of Distribution Functions under Order Restrictions," Statistics & Risk Modeling, 5(3–4), 1987 pp. 251–262. Michail Bozoudis and Vasileios Papachatzis "Estimating a Distribution Function Subject to a Stochastic Order Restriction"